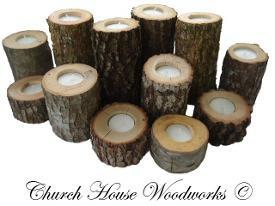 My husband and I sell handmade wooden candle holders so if you are interested in buying this product then please go to our Church House Woodworks Etsy Store to purchase these. These handcrafted tree branch candle holders would make a beautiful centerpiece for any type of Rustic Wedding Theme or Western Wedding Theme. Or if you just want to add some pretty decor to your table at home then these would be perfect! If you want to go to our Wedding website that we have then hop on over to www.Rustic4Weddings.com. We sell Rustic Wedding supplies such as candle holders, place card holders, food buffet label holders, tree branch pens with log holders, pine cones, christmas ornaments, centerpieces, flower holders and more.